Tucson Sector Border Patrol agents assigned to the Ajo Station in southwest Arizona apprehended nearly 270 migrants in less than 24 hours. The apprehensions illustrate the trend of migrant crossing in the dangerous Arizona desert continues in increasing numbers. Ajo Station Border Patrol agents patrolling west of the Lukeville port of entry came upon a group of 164 migrants on Tuesday afternoon. The following day, agents encountered another group of 100 migrants in the same area, according to Tucson Sector Border Patrol officials. Officials stated the two groups were composed of family units and juveniles who traveled to the U.S. from El Salvador, Guatemala, and Honduras. The migrants ranged in age from 11-months to 59-years-old. All of the migrants were in good health, officials stated. Tucson Sector officials are seeing a significant increase in the apprehension of families and unaccompanied minors this year, Breitbart Texas reported. The arrest of Family Unit Aliens in the Tucson Sector increased from 1,755 in FY 2017 to 3,431 in FY 2018 — up 95 percent, according to the August Southwest Border Migration Report. Unaccompanied Alien Children apprehension rose by 44 percent from 2,994 in FY 2017 to 4.323 in FY 2018. 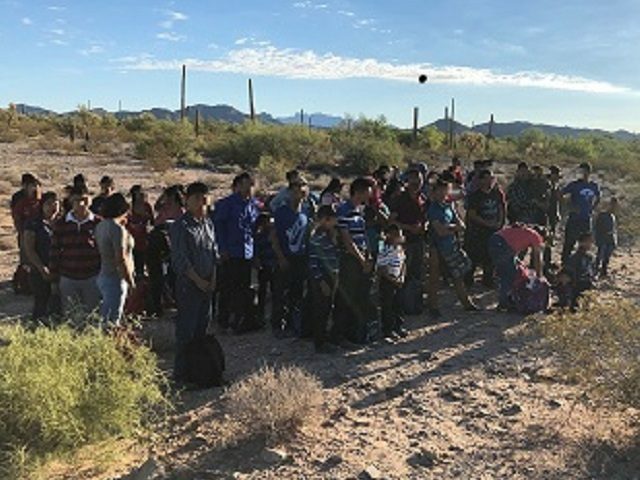 Earlier this month, Tucson Sector agents arrested a group of 163 migrants who illegally crossed the border from Mexico into the Arizona desert. The group comprised of men, women, and children–including a four-month-old infant, Tucson Sector Border Patrol officials stated. “Transnational criminal organizations exploit the vulnerability of foreign nationals with false promises of legal status and encourage dangerous border crossings, which place lives at risk,” Tucson Sector Border Patrol officials said in a written statement obtained by Breitbart Texas. So far this year, nearly 296 have died attempting to illegally make their way to destinations in the U.S., according to the Missing Migrants Project. More than 80 of those died in southern Arizona.